27 October 2012, What a spectacle...Wedding Spectacular! 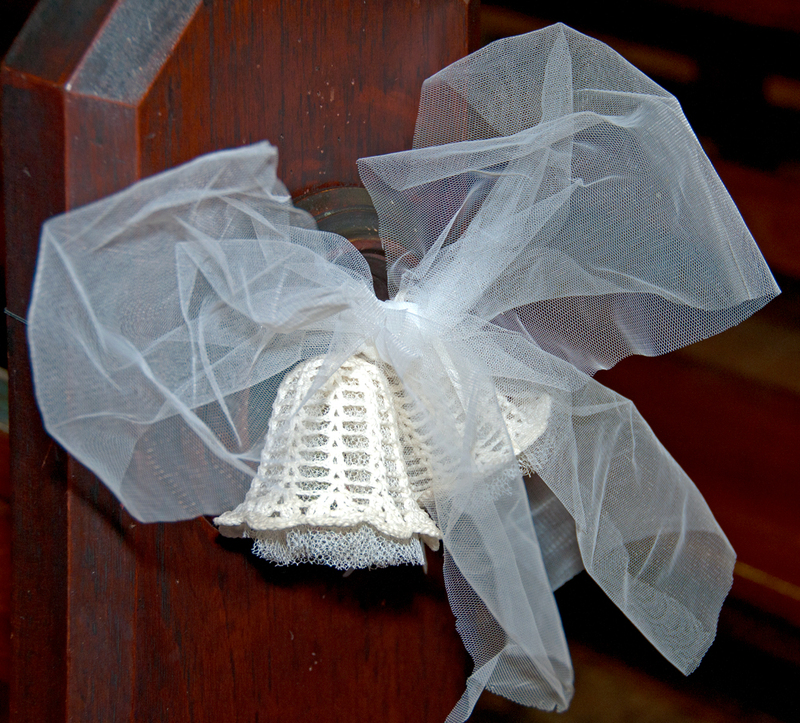 The church was full of expectant people, but not one was a groom. 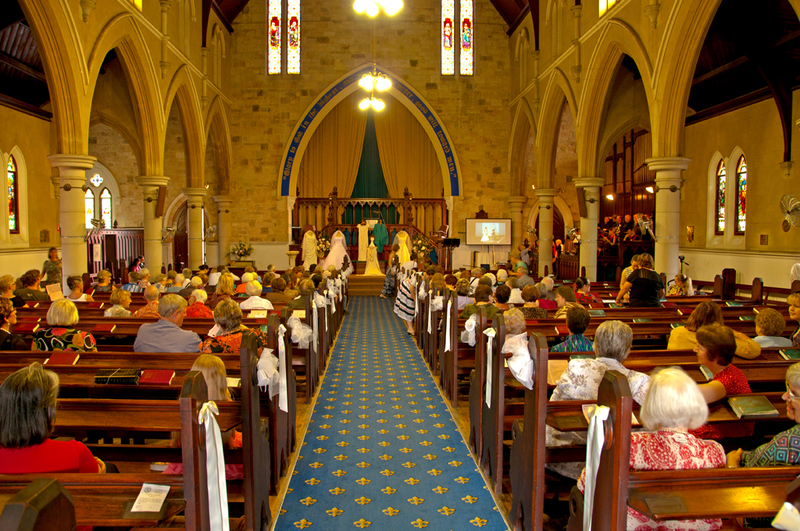 On the afternoon of Saturday, 27th October, a large crowd of people gathered in St Paul’s Presbyterian Church, Spring Hill, to participate in a Wedding Spectacular. 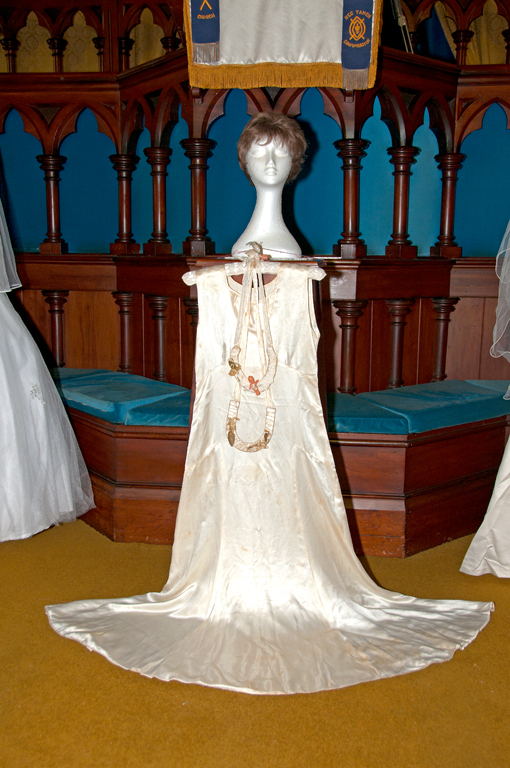 Through the afternoon, the audience was treated to an exhibition of wedding gowns ranging in origin from 1905 though to 2012. Some wedding gowns were modelled by their original wearers while many others were presented by a group of delightful models. In previous weeks, there had been much fun in trying on various dresses and discovering just how personal the fit of a wedding dress can be. It became quite apparent that people were smaller fifty years ago – tiny waists and wrists and not as tall as we are now. 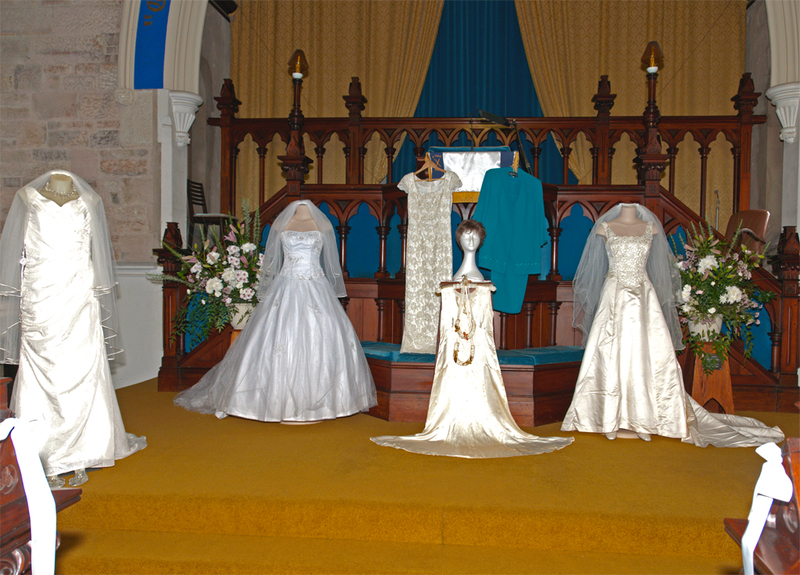 During the parade, we saw wedding gowns from mothers and daughters; from three generations of the same family; flower girls’ dresses modelled by that flower girl’s daughter, or niece; gowns sewn by the bride, by the bride’s mother and by designers. The wedding gowns varied in style from ornate, embroidered, beaded gowns with trains and veils through fashion-of-the-era, to a simple woven-patterned shift created by a shopfront tailor in a couple of hours, the day before the wedding. Accompanying the parade was a slide show of photos showing the bride in her dress on her special day, and often the whole bridal party. After each group of gowns was displayed, the models walked among the audience to allow a closer look, while music fit for a wedding was presented. The Brisbane Concert Choir and their musical director Debra Shearer-Dirié, performed beautiful choral pieces including Come Ye Sons of Art, Psalm 23, Alleluia, Ave Maria, and The Lord Bless You. St Paul’s own organist Neil Taylor accompanied by Neil Roberts on trumpet gave us wonderful renditions of; Bridal March by Wagner;Trumpet Voluntaries by both John Stanley & Jeremiah Clarke; Purcell’s Trumpet Air; March in Scipio & Occasional Oratorio by Handel; and Mendelssohn's The Wedding March. The audience even got in on the act, singing O Perfect Love & I'll Walk Beside You. Our special guest at the Wedding Spectacular was Mark Foley CEO of Youngcare, who with attended with his wife. Youngcare is the 2012 Mission Focus for St. Paul’s, and Christine Campbell was able to present Mark with a cheque as part of our contribution to the charity’s work. Mark told us about the aim of Youngcare, which is to provide a suitable place for young people with high care needs to live. Many high needs young people are placed in aged care, where their physical needs can be met but which is unsuitable for the social and emotional needs. Mark commented that viewing a whole range of wedding dresses was not how he usually spent a Saturday afternoon, but that he had enjoyed the parade very much. Once the parade was finished and the last strains of the Wedding March had faded away, the audience went outside to mingle – just as wedding guests do. Many people spotted friends and faces from long ago, and did a bit of catching up. 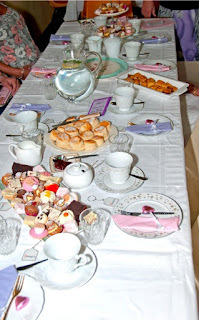 Then it was time for tea! 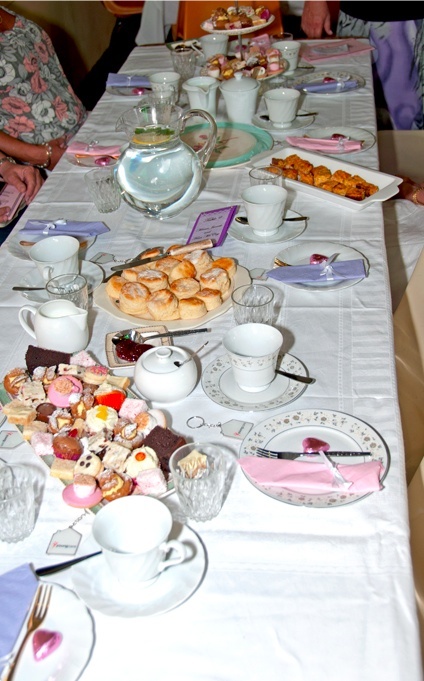 A team of dedicated workers had created a high tea paradise in the hall: tables were set with delicate fine china, and graced with morsels of delicious food on elegant platters and silver salvers. The hall was a hubbub of conversation as everyone enjoyed their tea and discussed the magnificent demonstration of the art of the wedding gown. When the participants began to head for home, it was undoubtedly with a feeling of peace and satisfaction after an afternoon well spent. The many and varied people involved in organising and running the day had achieved a great success. In revisiting weddings spanning a century, and music spanning even longer, we have celebrated the joy, the expectation, the wonder of the wedding ceremony, as well as the sincerity and solemnity of the ritual, and we have rejoiced in the institution which some say is disappearing but which clearly has great significance to the many who attended the spectacular Wedding Spectacular.